On Friday night, Trump repeated the claim that last year's attack "destroyed 20 percent of the Syrian air force," but that has never been verified. 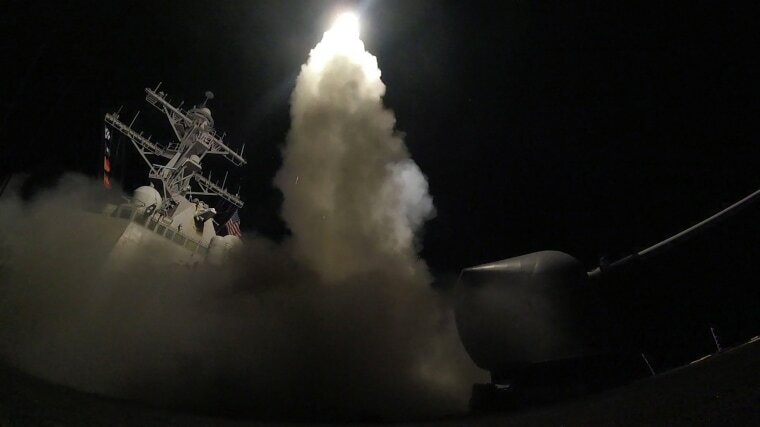 Almost exactly one year ago, the United States fired 59 Tomahawk cruise missiles at a Syrian government airfield in retaliation for a chemical weapons attack that killed more than 100 people. President Donald Trump proclaimed that the April 6, 2017, airstrike was in the “vital national security interest of the United States,” and images of U.S. destroyers launching missiles into the night sky were seen on televisions around the world. But on balance, according to U.S. national security and military analysts, last year’s action against Syrian President Bashar al-Assad’s regime did little to stop the bloodshed that has raged in that civil war-torn country for nearly a decade. A month after the 2017 airstrike, the Syrian military began moving fighter aircraft and personnel back to Shayrat Airfield in Homs and repaired some of the damaged infrastructure, three U.S. defense officials told NBC News at the time. And, as last week’s suspected nerve agent attack in the city of Douma seems to show, the U.S. action did not deter Assad from again using chemical weapons against civilians. The strikes had “absolutely no impact whatsoever on the course of the war, which has killed hundreds of thousands of people,” Gen. Barry McCaffrey, a military analyst for NBC News, said on Friday night. All but one of the missiles launched that night hit their intended target, a U.S. military official told NBC News at the time. The other missile failed. The missiles were launched from the USS Ross and the USS Porter in the Mediterranean Sea toward the airfield. Americans believed it had been used by Assad’s forces to carry out an attack on April 4, 2017. U.S. officials told NBC News at the time that aircraft and infrastructure at the site were hit, including the runway and gas fuel pumps.